Thanks to Burt from the RallyMoto club, I had my first taste of riding following a roadbook on Sunday. It's something I've wanted to do for a long, long time but I've never had the opportunity. I was really excited to have a go and see how I got on, I've ridden following maps on the tank before, but this is a different ball game. For those of you who may not be familiar with a rally roadbook, it's a set of navigation instructions printed on a roll of paper. The instructions in their most basic form will typically have a distance marker, a "tulip" which is a pictorial representation of the navigational instruction in the form of an arrow, and any warnings or notes. 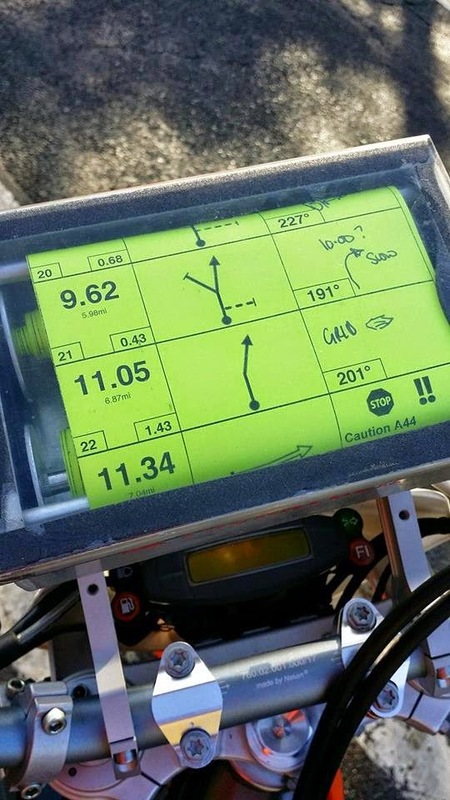 The idea is that you calibrate your odometer or "trip" on your bike to match the distances and thereby match up the instructions with the distance markers. Occasionally corrections will need to be made to your trip, and these can be adjusted as you move along using a switch connected to your odometer. The paper roll of instructions is what's known as the roadbook, which fits in a roadbook holder. This is then mounted on the handlebars or fairing and encloses the roll so that it's kept out of the elements. The roadbook holder also allows the rider to scroll through the roll. With the most basic "manual" roadbook holder, there are two knobs which allow you to scroll the roadbook forwards and backwards. That is what I was using, so it was important to time the scrolling carefully in order to avoid any dangerous situations! I have to say I absolutely loved it, it's right up my street (as they say)! I really enjoyed the extra challenge it provides and it was hugely rewarding to be able to follow the roadbook. Admittedly I got lost a few times, but that didn't put me off. I knew almost straight away when I'd gone wrong (the instructions start making no sense), it was a case of going back to the last known correct navigation instruction and having another go, but I actually enjoyed that too, it's even satisfying to correct a mistake! I can't wait to have another go, it's definitely something I want to do more of and when I can scrape enough pennies together I'll get my own basic kit over winter and practice as much as possible. If anyone is interested in finding out more about roadbooks, training or upcoming UK roadbook events, have a look at the All Terrain Rally Challenge website.